As someone who was on the receiving end of some pretty unfair punishments in school, and having witnessed school officials blatantly flout the rules on a number of occasions, it’s good to see someone get called out for a punishment that’s out of step with policy. 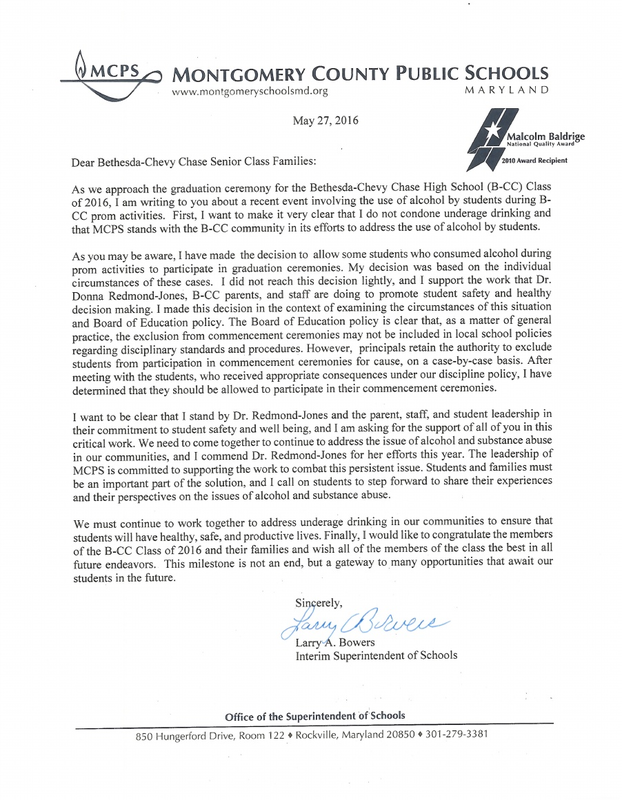 This was the culmination of a controversy regarding several students’ drinking alcohol on prom night at Bethesda-Chevy Chase High School‘s senior prom, and the reversal of a decision that would have prevented them from attending their high school graduation. Students and/or guests who are suspected of being under the influence of alcohol, inhalants, illegal drugs or controlled substances will not be admitted to Prom or After Prom. Students attending Prom or After Prom who show signs of being under the influence of such substances, or who are found to be in possession of such substances during either event, will be subjected to the consequences set forth in the B-CC Student Handbook, and their parents will be notified. If the student is part of an athletic team or other school-sponsored activity, the coach/sponsor will be notified as well. Note that any senior who is determined to be under the influence or in possession of such substances when arriving at or during the course of Prom or After Prom will not participate in the on-stage distribution of diplomas at B-CC’s graduation ceremony. According to the Bethesda article, this was “reinforced at multiple meetings with seniors and parents throughout the year.” I found the proviso on the third page in a PDF of a Powerpoint presentation from the school’s website as well. The hope, of course, is that it’s just a threat, and that everyone will have a nice, alcohol-free prom night. After all, these are, for the most part, 17 and 18-year-olds. In other words, they’re underage. Say what you will about where the legal drinking age should be set (I think it should be 18), but at the moment, it’s 21. And unfortunately, not everyone kept things dry, as six students got nailed for alcohol violations at the prom. And, as promised, they were excluded from participating in the graduation ceremony. However, you take away a student’s ability to walk across the stage to receive their diploma, there are other stakeholders who will get upset, and rightly so. Everyone wants to see little Johnny graduate high school, after all. And the families of some of the affected students made formal appeals to the superintendent. That led to a reversal of the ban by Interim Superintendent Larry Bowers, announced via a letter to the senior class. The letter, in a nutshell, says that while the superintendent supports the efforts of the school to promote safe and healthy decision making and the like, the graduation ban is not allowed per district policy, and therefore cannot stand. In other words, the principal, Dr. Donna Redmond-Jones, enacted an illegal rule (illegal in the context of the school district, mind you), and her illegal rule was overturned. Local school staff, in collaboration with students and parents, shall develop, implement, and enforce disciplinary standards and procedures which may limit or restrict participation in extracurricular or other school-related activities or events. Exclusion from commencement ceremonies may not be included in local school policies; however, principals retain the authority to exclude students from participation in commencement ceremonies for cause on a case-by-case basis. What this does is place the graduation ceremony in a special category. While it allows for students to be banned from attending graduation, it also says that such a sanction may not be included as a matter of policy, but may only be invoked on an individual basis. By including the graduation ban in the prom agreement and such, the principal had, intentionally or not, included the ceremony in local school policies, which goes against the JFA policy. One Reddit commenter asked, “[W]hy was she the first principal whose decision was overturned after all of these years of other principals doing the same thing?” It seems to parallel very closely to real life. In real life, an unconstitutional law could be on the books and enforced for many years before someone challenges it in court. However, once challenged, a law can be thrown out by the courts as unconstitutional. The same thing happened here, but on the administrative side of things rather than judicial. The policy causing the sanction was challenged, and it was thrown out as violative of district policy. And if the superintendent hadn’t overturned the bad local policy, then the parents would have almost certainly filed a lawsuit, and the graduation ban would have been overturned in court, citing district policy JFA as the reason why. Large sums of money in damages might have resulted, and I don’t know if that would have been the best use of district funds. Now this is not to say that the students should not have been punished. According to Bowers, the students “received appropriate consequences under our discipline policy.” I don’t know what the sanctions were, as the school district, understandably, is unable to speak about individual student discipline. And considering that the prom took place on May 6 and graduation was on June 1, there was plenty of time to implement whatever punishments were necessary and get everyone to graduation. And in the case of an alcohol violation, several days’ suspension would not be out of line by any means, which could have significant consequences for a senior in their final month of school – more so than missing a ceremony – as well as aim the punishment directly at the students in question, rather than punishing family members who themselves did nothing wrong. A graduation ban also seems to turn drinking at prom into an unforgivable sin, which I think is a bit over the top. After all, at the conclusion of the graduation ceremony, everyone goes their separate ways, and the class will not be together again for a very long time, if ever. Where a suspension or similar short-term punishment says, “You made a mistake, and we will issue sanctions for it, but then will welcome you back when it’s over,” a graduation ban says, “You messed up so badly that we can never forgive you for this. You’re out of the family.” I don’t think this rises to that level of seriousness. I think that the overarching lesson to be learned here is that the rules apply to everyone, and everyone must operate within the rules, regardless of rank or title. Too often, school personnel openly flout the rules. Whether or not this was a deliberate flouting of the rules is unknown, but I consider it unlikely that it was intentional, especially considering that the original punishment was somewhat common in Montgomery County high schools, though not universal (though I’ll bet it’s seen its last year of use anywhere in the county). However, intentional or not, school personnel got caught breaking the rules, and a correction was issued. I think that this is perhaps a more important lesson than the original. The principal is not some omnipotent authority figure. While they are authorized to mete out discipline for rule violations, they themselves are subject to rules as well, which are equally important to follow. The principal chose, whether intentionally or not, to deviate from the rules. And consequences came out of that deviation – in this case making the principal look foolish for prescribing an illegal punishment. With graduation bans now effectively off of the table for prom-related alcohol violations in Montgomery County, hopefully this leads to an intelligent discussion (as compared to these the-principal-is-the-ultimate-authority article comments) about what the best sorts of sanctions are for people who drink during prom and other school events. After all, people in this age group engage in enough risky behavior as it is, without adding alcohol into the mix. We want to encourage responsible decision making so that these kids can survive into adulthood and look back on their teen years and say, “Wow, what was I thinking back then?” Progress as a community on how to best handle those instances where students opt to break the rules in these instances, and how to handle responsible decision-making during prom season in general, should be the legacy of this incident.